Please complete the following information. You will be given the opportunity to add additional Growth Charts or other items to your order before the order is placed. To see a sample growth chart, click here. If this Growth Chart is a gift, please tell us what you would like to say on the gift note. You have up to 3 lines and 30 characters per line. Let us gift package your growth chart for you! 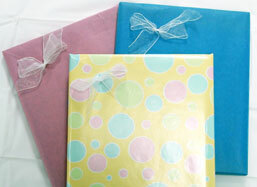 The growth charts are wrapped in attractive gift papers finished off with a white chiffon bow. Only $4.95 per item. None Yes, please gift wrap my growth chart.